Recently, I visited the Pandora Spa in London for a Gong Bath event. As you all know, I’m obsessed with Gongs as I practice sound healing myself. I still remember experiencing a gong bath for the first time, around 2 years ago in Santa Monica. I was completely blown away by the power of the gong’s sound, and all of the different ways it could make you feel. Since then, I have experienced numerous gong baths in Kundalini Yoga sessions, Meditations, Sound Baths and in my Sound Healing training. With every experience I have, I always manage to fall in love with the sacred sounds even more. So, when I was invited to attend Pandora Spa’s event, I was really excited to experience their sounds. Every gong bath I’ve been to has been such a different experience, so I’m always eager to see what happens. I was particularly looking forward to this event as Pandora Spa have such a vast, incredible collection of different Gongs. Seeing all of their collection in one space was like walking into heaven! I knew that the variety of sounds I was going to experience would be incredible. Their selection of gongs included two 22″ dance gongs, two 30″ water gongs, a 42″ cosmo gong, 42″ earth gong and an amazing 62″ cosmo gong! I arrived at the event early, and was there just in time to watch the liquid cacao drink be prepared for the cacao ceremony at the beginning of the sound bath. It was great to watch and smell of the delicious cacao brewing on the stove! Then, shortly after, it was time for the event to begin and a group of us gathered around the sound room and sat in a circle. The bath began with each of us drinking a cup of liquid 100% cacao – with the option of adding some cayenne pepper or sweetener. Then, when we had finished our drinks, it was time for the sound. The cacao drink instantly gave me an energy buzz, and really heightened my sensitivity to my surroundings. We were then asked to lie down on the floor, underneath a Pandora Star as the gong playing commenced. The Pandora Star is a light machine which sends your mind into a trance state (you can read more about it here), so was used in combination with the gongs to deepen the meditative effect of the process. As we laid under the lights, different waves of sound began to travel through the room, and you could hear the different tones of each of the gongs washing over your body. In my personal experience, gongs cause my mind to race and think at a much faster pace than usual – so this sound bath with its combination of cacao and pandora star, instantly sent myself off on a crazy journey. 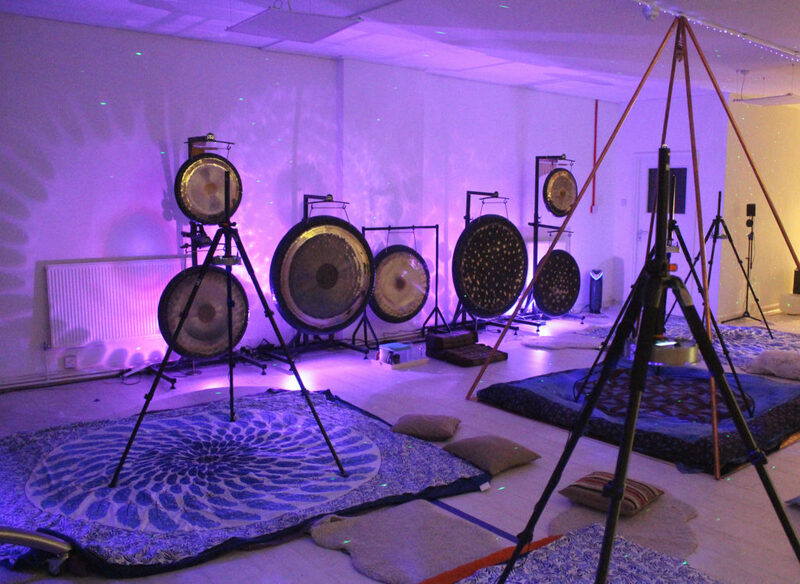 The sound bath was split into two sections, with a short break in between the first gong playing section to ground ourselves, and stay balanced in our bodies after the first wave of different sounds. Then, in the second part we also listened to different music and mantras, and were each given some Reiki and healing with tuning forks which I really enjoyed. The whole event lasted about two hours, and after the sound came to an end, we closed the circle and said our goodbyes before heading back home. When the sound bath finished, I was feeling renewed, vibrant and full of energy. I didn’t manage to get to sleep that evening until after 1am! Ohhhh a Gong Bath, I never knew Gongs were part of sound healing. I’ve experience sound therapy using glass bowls, it was life changing. I can only imagine the effect a gong bath would induce. Thanks for this post, it is very timely for me!